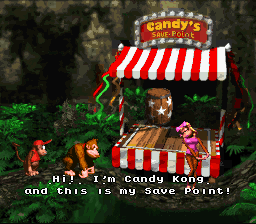 Candy's Save Point is a booth run by Candy Kong in Donkey Kong Country, where the player can save their progress at. This location only appears in the Super Nintendo Entertainment System version and has been changed to Candy's Challenge in the Game Boy Color port, then Candy's Dance Studio in the Game Boy Advance port. In Donkey Kong Country, a Candy's Save Point appears in each of the six worlds of Donkey Kong Island. When Donkey Kong and Diddy Kong jump into the Star Barrel, the player's game progress is saved. Oftentimes, Candy advises the Kongs to save their game "before it's too late" (which refers to if they were to lose their progress). The Save Point was replaced in both the Game Boy Color and Game Boy Advance ports, as the player's progress is saved from the world map. In addition, Candy's Challenge from the Game Boy Color port shares the same outward design as the Dance Studio. Candy's Save Point makes a cameo appearance in Super Smash Bros. Ultimate in the DK Island subarea of the World of Light, which in itself is a recreation of the Kongo Jungle world map from Donkey Kong Country. It is the location from which Candy Kong's spirit is fought. In the Club Nintendo comic, Candy's Save Point appears in the second part. However, it does not serve its original purpose of allowing the Kongs to save; instead, when Donkey Kong and Diddy Kong arrive, Candy provides them with Squawks the Parrot. This page was last edited on April 9, 2019, at 16:12.